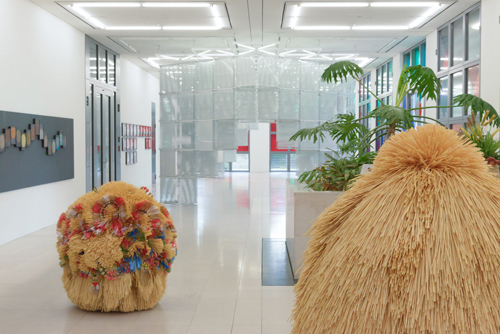 In her solo exhibition at the Gallery of Contemporary Art, the Berlin- and Seoul-based artist Haegue Yang (b. 1971) presents a large-scale installation of 17 individual works that refer to both industrial developments and folk craftsmanship. Modernity and tradition, industrial advances and folksy origins are juxtaposed without comment in Yang’s works, which display a variety of working techniques, ranging from installations made up of industrially manufactured products such as Venetian blinds to elaborately handcrafted sculptures. With their unconventional arrangements, an altering visual language of formal abstraction and narrative figuration unfolds. Under the title Quasi-Pagan Serial, Yang’s vibrant staging responds to the architectural design of Oswald Mathias Ungers’s Gallery of Contemporary Art. 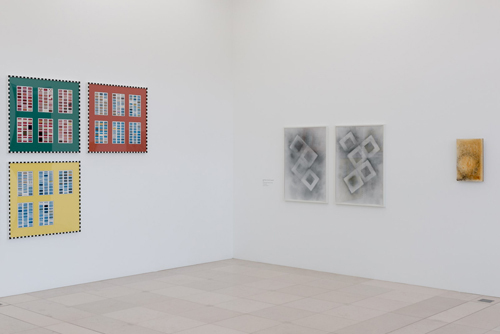 Unger’s austere, geometric grid-based structure is reflected in various manners in the sequential nature of the works on display. 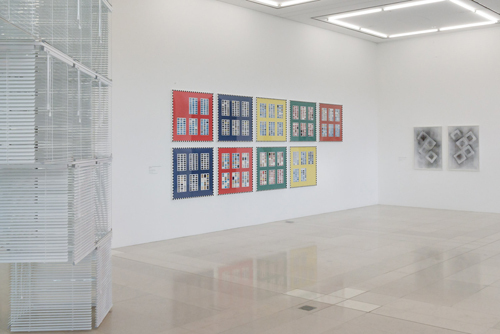 In the two large-scale Venetian blinds installations, Sol LeWitt Upside Down, which relate to the work Cube Structure Based on Five Modules (1971–1974) by the American Conceptual artist Sol LeWitt, the cubic formation and serial manner of the structures appear to paraphrase the dominant architectural elements. Placed directly at the entrance to the show, Sol LeWitt Upside Down introduces the motif of the grid yet is positioned at a right angle to the space’s own grid structure. 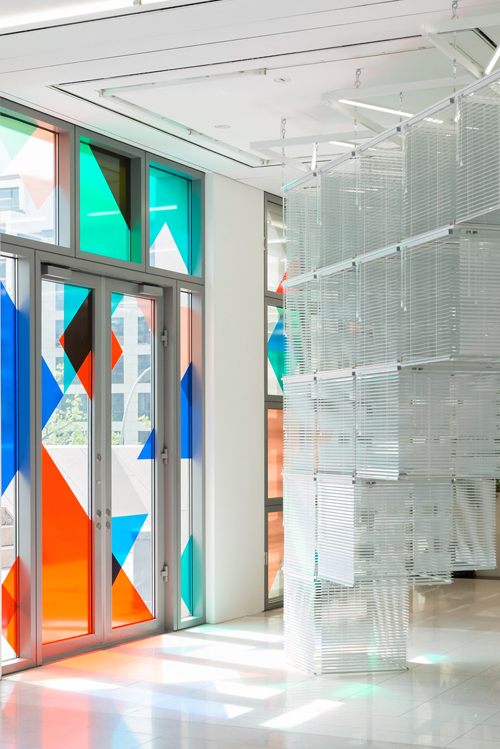 The supposed neutrality of the white Venetian blinds also stand in deliberate contrast to the gallery’s windows’ colourful patterns, which cast various hues on the sculptures depending on the time of day. In contrast to the light-suffused transparency of the central exhibition space, the room with the series Sonic Half Moons(2014/15) has been darkened as a result of opaque films obscuring the light from the windows. The strict geometry of the space forms a backdrop for six spherical sculptures hanging from the ceiling. 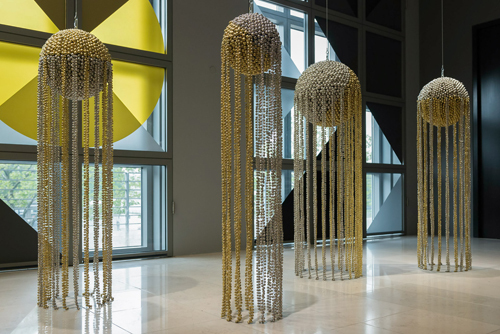 Studded with metal bells, the sculptures can be set in motion by hand, causing the dangling bell-chains to create hypnotising choreographies with their synchronised tentacle-like formations whilst absorbing and dissolving the light’s reflection. The four anthropomorphic straw sculptures The Intermediates invoke folk motifs, rituals or dance formations from various regions such as Africa, South America, and Southern and Eastern Asia, yet they appear as hybrid characters. 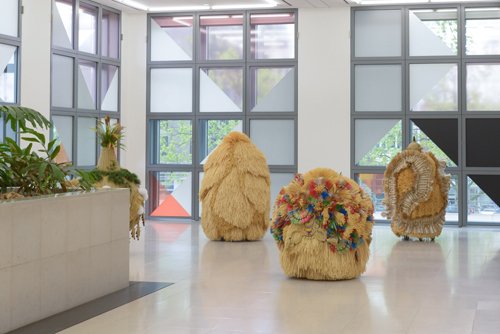 Ironically, the sculptures are made from artificial straw – a surrogate for its natural counterpart. Abstract and rife with associations, they seem like mysterious figures from an alien world – our own civilisation. 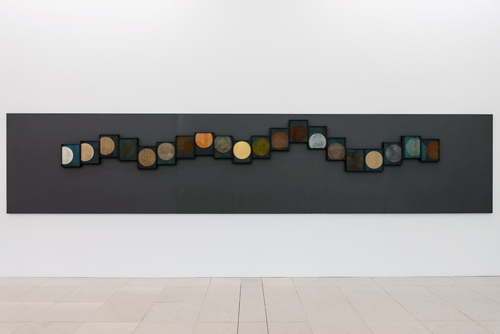 Spice Moon Cycle (2015) is a linear print sequence on sandpaper comprising of partially cropped circles. Drawing inspiration from the moon as a cyclical, natural phenomenon, Yang’s visulation is created using 20 different spices. Purchased in local markets during an artist’s residency in Singapore in 2012, the spices can be read as a map or “imprint” of everyday life whilst also referring to Asia’s colonial history and the conflict-ridden past of the spice trade and its global implications. Quasi MB – In the Middle of its Story (2006–2007) evokes Marcel Broodthaers’s legendary work La Pluie (1969) and can be read as the artist’s subjective response to the Western avant-garde. Samples – Wai Hung Weaving Factory Limited, Hong Kong (2015) appears at first glance to be a mere physical representation of a company product. Consisting of a complete collection of pattern sheets from the manufacturer, the work presents an inconspicious history of a local fabric manufacturer in a new context. Additionally, the nine frames of richly contrasting colours strongly recall the aesthetic of the Italian architect and designer Ettore Sottsass (1917–2007). Non-Foldings – Geometric Tipping #58 (2015) and Rainy Dirty (2012) each belong to a larger series of either spray paintings or lacquer paintings. The latter are wall-hung works coated in simple wood lacquer that document the traces of the weather as well as deposits of dust and dirt, functioning, in Yang’s words, like “flypaper” for their environment. The >Non-Foldings are silhouettes of folded polygonal, paper objects whose vague outlines provide only a hint of the actual shape of the missing objects. 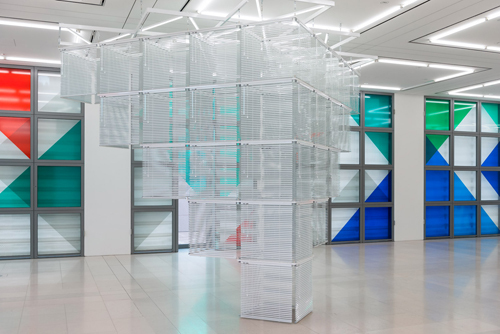 Haegue Yang (b. 1971 in Seoul, South Korea) took part in documenta 13 in Kassel in 2012 and in 2009 she represented South Korea at the Venice Biennale. She has had numerous solo exhibitions, most recently at the Ullens Center for Contemporary Art in Beijing, China, 2015; the Leeum, Samsung Museum of Art in Seoul, Korea, 2015; the Bergen Kunsthall in Norway, 2013; the Aubette 1928 and Museum of Modern and Contemporary Art in Strasbourg, France, 2013; the Haus der Kunst in Munich, 2012; the Kunsthaus Bregenz in Austria, 2011; Modern Art Oxford, UK, 2011; the Aspen Art Museum, USA, 2011; and the Walker Art Center in Minneapolis, MN, USA, 2009. Additional exhibitions of the artist’s work will open this year at the Serralves Museum in Porto and Centre Pompidou in Paris. This presentation kicks off the new exhibition format Uncharted Territory. At yearly intervals, the Kunsthalle will invite international artists to conceive a show for this new project space that engages with global processes of change and issues of migration, identity and place, and loss and belonging. Uncharted Territory and related acquisitions for the Hamburger Kunsthalle’s collection are made possible by the Stiftung für die Hamburger Kunstsammlungen.